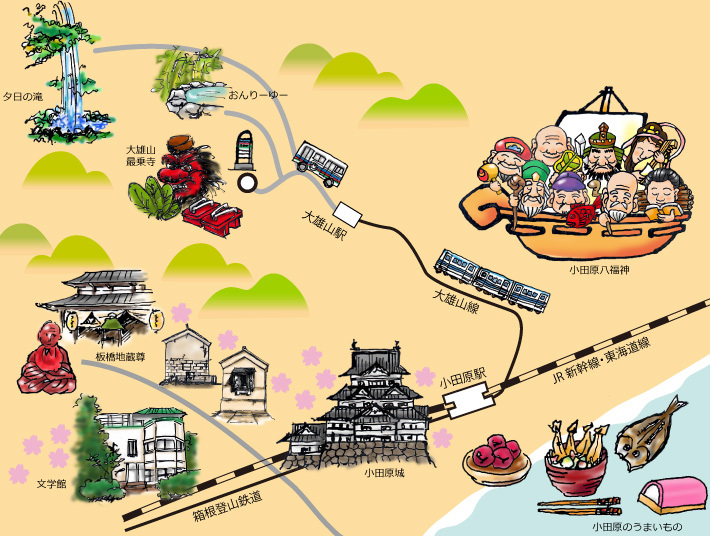 Odawara Castle will remind you of both the SENGOKU era and EDO era, the ITABASHI area makes you think of the TOKAIDO way, and SENDOKOUJI street is famous for KAMABOKO (Fish cake) and HIMONO (Dried fish) factories and shops all lined up. ISHIGAKI Mountain has a sweeping vista of the SAGAMI bay and DORYUSON SAIJYOUJI Temple is famous for TENGU (Long-nosed goblin), which is located next to Odawara. You will see many historical places in Odawara.